Fitness doesn’t have to cost money. It can be fun and free! Bring a friend and join us for a walk on Wednesday mornings at 10 am. 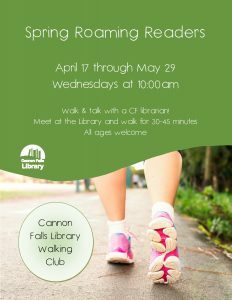 We’ll meet at the CF Library. You can talk to fellow walkers about your latest read or anything you like. The walk will last 30-45 minutes. *All participants must sign a waiver before participating.